Guatemala is the most populated country in Central America. Audiological care in the country, however, is very limited – there is only one audiologist in all of Guatemala: Paty Castellanos. She is the founder of the “Sonrisas que Escuchan” foundation (smiles who listen). Hear the World supports this organization with donations of hearing aids and volunteers. 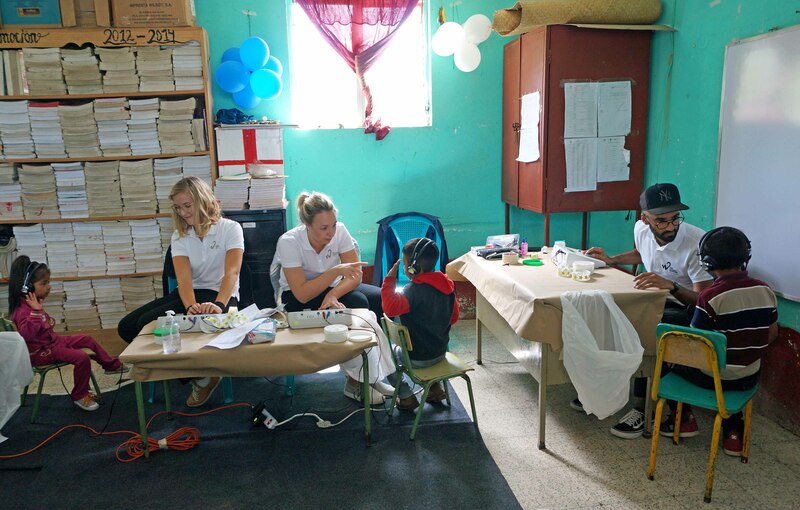 The “Sonrisas que Escuchan” foundation has conducted hearing screenings throughout Guatemala for around nine years and also supplies hearing aids to those who could otherwise not afford them. The donation from Hear the World will make it possible to supply more children with high-quality hearing aids. Paty Castellanos trains independent specialists in various areas. The staff she trains conducts hearing screens in schools and screenings for newborns in hospitals. Children and babies with hearing loss are provided with hearing aids. The hearing aids are adjusted on-site or the children are referred to the clinic to receive a more detailed diagnosis after further testing. In addition, the team conducts hearing screenings throughout the country, traveling for several days at a time through the regions. Word spreads when the team is in the region. In September, Sonova volunteers traveled with Sonrisas que Escuchan staff through the Sololá region in the southwestern Guatemalan highlands to various schools to conduct hearing screenings. Word spreads, and on the third day a mother arrived at the school with a 4-year old boy, whom she suspected of having hearing loss. The hearing tests confirmed her suspicions and the team was able to fit him right away with two new Phonak hearing aids. Jonathan de Jesús chose red hearing aids with football stickers. The team produced temporary ear molds for Jonathan – the regional team will bring him the permanent ear molds the next time they visit, which will be produced by the Sonrisas que Escuchan staff in the laboratory in Guatemala City. The children at the school “Escuela Experimental Villa de los Niños” in Guatemala City are often exposed to loud noise during shop class. There is also a woodcutting machine in the work room. 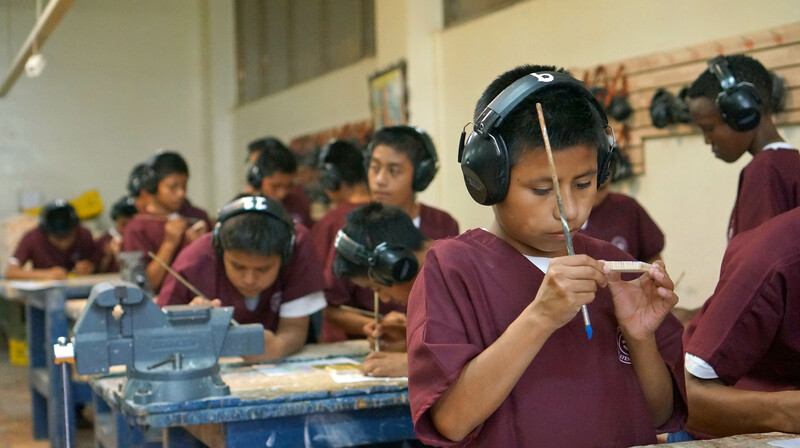 To prevent the noise from damaging these children’s hearing, the Guatemalan organization Sonrisas que Escuchan has donated hearing protection for the children. Noise-induced hearing loss had already been detected in some of the children beforehand. In future, with the new hearing protection, the children will be able to obtain important manual skills without endangering their hearing in the process. The children wait patiently in line in front of the classroom where the hearing tests are being conducted. The volunteers first conduct otoscopy to check whether the children’s ear canal is healthy and whether earwax or foreign matter blocks the auditory canal. The ear canals are cleaned if they contain excessive amounts of earwax or if they are blocked with foreign matter. Audiometry is then used to determine whether the children can hear well. To determine their hearing ability, sounds in various frequencies and volumes are played and the children must indicate whether they can hear the sounds with their left and right ears. Children for whom hearing loss is suspected are retested using OAEs. Children with hearing loss, like Antony, receive high-quality hearing aids and regularly receive follow-up treatment. With the non-profit Hear the World Foundation, Sonova advocates equal opportunities and improved quality of life for people with hearing loss around the world. The foundation particularly focuses on projects supporting children with hearing loss, to enable them to develop at the appropriate rate for their age. The Hear the World Foundation supports people and particularly children in need with hearing loss around the world and gets involved in prevention. The focus is on projects for children to enable them to develop at the appropriate rate for their age. You can help with a donation. Everyday life in one of the poorest countries in Latin America has very little in common with the holiday idyll we know. For many Dominicans, accessing medical care is beyond reach of whom almost half live in slums. We want to change this. In Appalachia there are many people with hearing loss as a result of noise exposure in the local coal-fired power stations. Hear the World provides a local aid project with hearing aids and funding and sends volunteers. In Brazil, the population often has to undertake a long journey to receive audiological care. The Hear the World Foundation changes this circumstances by training experts for more centers providing comprehensive audiological care in the future.